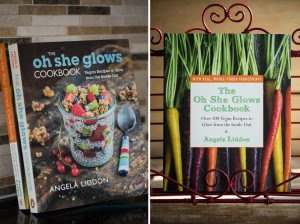 This is Angela from Oh She Glows emailing you with a second OSG Cookbook Newsletter. Wow, two newsletters in 2.5 years..I’m on a roll!! Well, it’s been an exciting week around here to say the least! 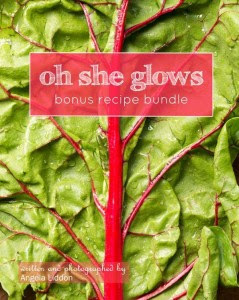 The Oh She Glows Cookbook officially launched on Tuesday March 4th, hitting shelves across North America. I can’t thank you enough for all your support! The cookbook is on the Bestseller lists for Amazon.com, Amazon.ca, and Chapters/Indigo and the feedback has been great so far. Many locations in Canadian Costcos are selling the book too! Hopefully all locations with time. You will notice there are two different covers. The parfait cover is the Canadian edition (it also has French Flaps) and the carrot cover is the US edition. The content is the same though! Don’t forget, you can still take advantage of my Bonus Recipe Bundle offer this week (until Saturday!). If you order the book by Sat. March 8th, you will get this bonus bundle of 10 NEW recipes not in the OSG Cookbook! The Vegan Cheese ball recipe and black bean brownies are not to be missed. Just a token of my thanks! You can fill out the bonus recipe bundle form here. Many of you have been sharing social media pictures of the OSG cookbook in local bookstores, as it arrives in the mail, and recipes you’ve already made. It’s been so much fun to see this and I’ve been re-tweeting as many as I can keep up with. 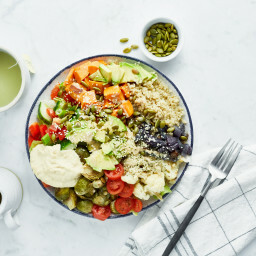 Please keep sharing your photos on twitter, Facebook, Instagram, and Pinterest using the hashtag #osgcookbook and also tag @ohsheglows #ohsheglows so others can see what you’re making too. Thanks again for all your excitement and support!! You sure know how to make a girl feel loved. I had the pleasure of being on Canada AM this week! You can check out the segment here. In case you missed my post this week, I did a big blog post on the cookbook with tons of sneak peek photographs, info, and more! Check it out if you haven’t already. That’s all for now. I can’t thank you enough for supporting my journey to writing my first cookbook. I can’t wait to see what you make! It was so cool to see the video of you! You speak as well as you write. Congratulations on your book! I love the food I love the pics I love your honesty. Purchased your book last week and made your Glo bars last night, definitely taste even better than they look! Excited to try other recipes. Do you know where I can find out about nutrition info (calories, protein, carbs, etc.) of your recipes? I have a question about a recipe on page 155 “Our Favourite Veggie Burger”. Step two says to add “flaxseed mixture” maybe I looked too much and didn’t see, but I didn’t see what goes in this mixture, I just see 1 tablespoon of ground flaxseed. Is that all it is? I’m just used to mixtures meaning there is something else, but if it is just the flaxseed, great. Sorry to bother you, just wanted to clear it up and I had no other way of asking! Thanks again!! Just tried your kale chips recipe and it’s wonderful! I was wondering if there are recipes in your book for diabetics? My husband was recently diagnosed and it’s very hard to get him off carbs which he loves. Your recipes look awesome! I absolutely love your cookbook. When my meat-eating friend saw my cookbook she purchased one too. I cook oil-free and have found that any recipe in your cookbook that I have tried works well without the oil. I keep getting requests from my friends at church for recipes when I make meals using your recipes. Thanks for sharing such an amazing cookbook with us. I love the fact too that it is so colourful. Also love your blogs. I just purchased your cookbook, and I love it, Angela ! There are so many fabulous and inspiring recipes, that I have a problem to decide what to do first. I’m a newbie when it comes to smoothies, so definitely I’m going to give it a try. I like buckwheat – kasha, it’s very popular in my home country (Poland.) Oddly enough, I have never tried buckwheat groats. Since I’m on a diet (again!) I’m looking forward to trying all your recipes, with a small dose (it’s a wishful thinking, I guess) of sweets and treats. 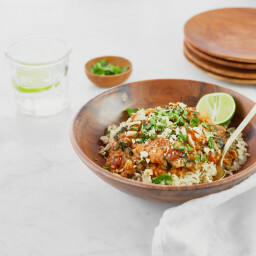 Do you have a newsletter with recipe ideas that you send to a mailing list? If so, I would love the regular inspiration/ reminder arriving in my Inbox! What fabulous information your website has. I have ordered your cookbook.